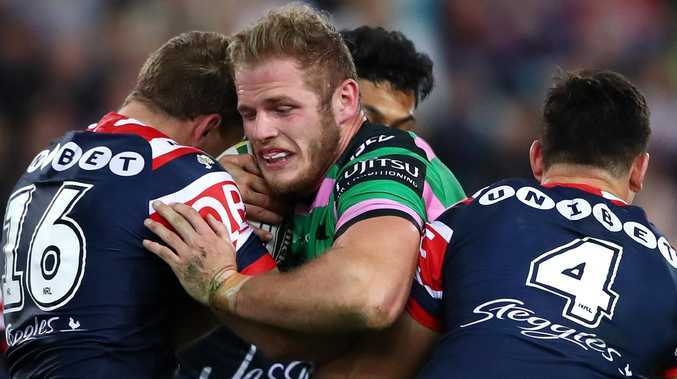 The Rabbitohs have re-signed Tom Burgess until at least the end of 2023. The 26-year-old was only contracted until the end of the this year, but the Bunnies impressed with his development since joining the club in 2013, have locked him up for a further four years. Last year, older brother Sam also extended his stay at Redfern until at least the end of 2023, while twin George remains off-contract after this season. In announcing the new deal, Rabbitohs' General Manager of Football Shane Richardson described Tom as "one of the best props in the game worldwide". "Tom has shown great improvement in his game each season since he joined the Rabbitohs back in 2013 and we believe his best football is in front of him," Richardson said. "He is a big body in the middle for us, he has worked hard on his attack and equally so on his defence in recent seasons. "He is one of the best props in the game worldwide and we're really happy to know that he will be representing our club for at least the next five years." The English international said he doesn't see himself playing anywhere else. "Souths is all I've known and I'm really pumped to be signed up long term now," Burgess said. "The club gave me a chance when I came to Australia for the first time, a 20-year-old young lad, not knowing what to expect. Now six or seven years down the track, I'm still enjoying my football here. "I love calling Sydney home and I wouldn't want to play anywhere else in the NRL than with the Rabbitohs. "To play my 100th game with Souths last year was really significant for me, but now it's about quality rather than quantity and I want to play my best each week."